Google's long-awaited online storage tool, dubbed the Google Drive, may soon be a reality. A detailed description of the GDrive was found in a file used by Google Pack, a suite of Google desktop programs, by blogger Brian Ussery. The decription says, "... GDrive provides reliable storage for all of your files, including photos, music and documents ... GDrive allows you to access your files from anywhere, anytime, and from any device -- be it from your desktop, web browser or cellular phone." So not only may the Google Drive debut soon, it looks like Google is also venturing into music storage as well as photographs and documents. Bloggers the world over have been scouring Google's servers and other corners of the Web in recent weeks to find definitive proof of the Google Drive. This discovery seems to confirm it. So what else is out there, and how did we get to where we are? Let's take a look. In early January, shortly after Google launched Picasa for Mac, bloggers discovered a reference to GDrive in the new program. 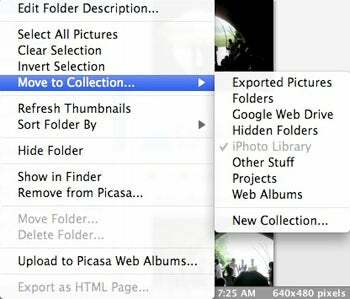 Right-clicking on any photo folder and following the "Move to Collection" command brought up an option for "Google Web Drive." This was the first major proof in some time that the storied GDrive was coming. Adding more fuel to the fire, Gmail's Product Manager Todd Jackson said this in an interview with CNET: "We know people's file sizes are getting bigger. They want to share their files, keep them in the cloud, and not worry about which computer they're on. Google wants to be solving these problems." Now, Jackson was talking about Gmail, but this statement made Google's future goals clear, and Google Drive watchers went into, well, overdrive. Peering through the the digital universe, Google Blogoscoped's Tony Ruscoe found a reference to what may have been an internal document from Google on Scrib.com, a Website to upload and share documents. The document was called "GDrive on Cosmo Getting Started Guide." Reportedly, the document suggested that the Google Drive will support both Mac and PC users and will integrate with other Google service like Docs, Picasa, and Gmail. Now when you check the page on Scribd you get a message saying, "This content was removed at the request of M. Homsi/Google." It's unclear what Cosmo is, but it may be some sort of upgrade to Google Docs. There was also a mysterious reference to something called Amethyst, and a suggestion that the lower end of the GDrive limit could be around 10 GB. Before long the Google Operating System blog found a reference to a "webdrive" in the Cascading Style Sheet for Google Apps. This led to the discovery of a tiny little icon on Google's servers called "mini_webdrive.gif," found here. Just like ol ‘Nessy's first pic the photo is hard to see, and while there's no doubt it's a storage icon, it could be anything (including the Gdrive). That brings us today's discovery. Pundits are already wondering if the Google Drive will herald the long-awaited "cloud revolution" by taking all files off your hard drive and moving them into the ether so they are accessible anywhere. Like anything else from Google, the GDrive is anticipated with a lot of exaggeration and predictions that it will revolutionize the web. If it is real, and free, the GDrive may be popular; however, something tells me we are still too mistrusting to allow all our files to disappear into the clouds. Maybe someday we'll be ready, but not yet.